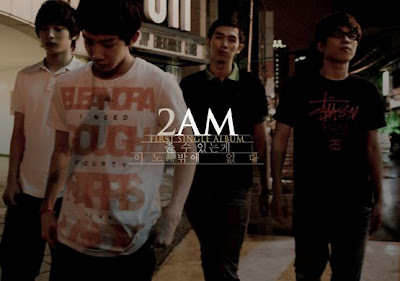 Korea Information Blog: JYP's 2AM - I wish them a big success! It is a group of 4 men. As you know, Jo Kwon is the oldest trainee in JYP as like Sun Ye in Wonder Girls. Other three members are: Im Seulong, Jung Jinwoon and Lee Changmin. JYP has debuted 2AM and then will debut 2PM. There is a rumor that he will make a 11 boys group with 2AM and 2PM. Since most of them have long experience as trainees, I wish them to make a big success! In this music video, Jo Kwon cries because he had a flash of his past life on practicing real hard. Anonymous November 20, 2008 at 5:03 a.m. seriously?? i thought it was something serious.. like he had to fight through a disease.. sighs. i don't think this song is very good.. it had typical lyrics.. the melody is cliche... and i think people just feel bad that it took so long for them and they're bumping them up. i know hard work is something to appreciate but if this is the best they can come out with, they won't last very long.